Most of people nowadays carry smartphones around with them wherever they go, and while this is useful for a multitude of reasons, it means if that so-called Kodak moment arises, it will not be missed. As time goes on, smartphone cameras have gotten much better, and through the last couple of revisions of iOS, Apple has experimented with ways to make it easier for iPhone, iPad and iPod touch users to quickly take a shot with minimal fuss. iOS brought he camera button to the lock screen, which has since evolved into an icon/slider, but if that still isn’t quick enough for you, jailbreak developer flux has come through with a nifty tweak called QuickShoot which allows you to take a shot almost instantaneously by tapping that Camera app icon. Often, there’s only a second or two to spare before the photo-worthy moment has passed, and in such instances, this tweak could be the difference between the perfect shot and that blurry, latecomer’s impression. Once installed, it doesn’t actually alter the existing functionality of your camera (you can still slide away and use as normal), but you have the added bonus of QuickShoot should you need it. Having used many such apps purporting to allow quick shots to be taken, this is probably the best solution, and is compatible with the iPhone and iPod touch. There are no configurable settings, simply install and go. 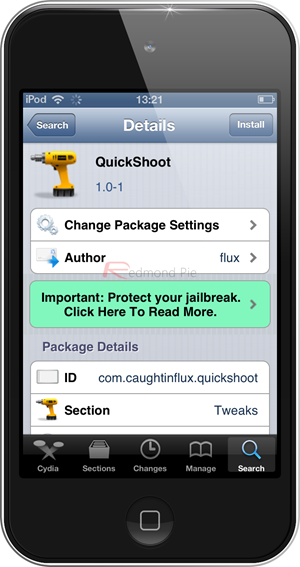 QuickShoot requires iOS 6 or higher in order to be installed, and of course assumes your device is jailbroken. If you’re on iOS 6 and have yet to jailbreak your device, but would like to, please check out our extensive how-to tutorial, which covers all the steps. 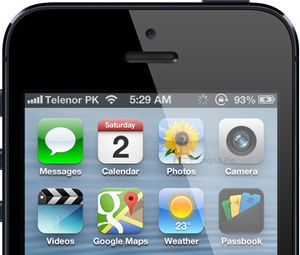 QuickShoot is absolutely free of charge to download, and can be located over at the BigBoss repository. At present, it will only take basic shots, and the lack of a settings panel mean you cannot add features like flash, exposure or focus. However, the developer has promised that these features will be arriving in a future update, so QuickShoot is well worth picking up via Cydia. Make sure to check out our iPhone Apps Gallery and iPad Apps Gallery to explore more apps for your iPad and iPod touch.